The ultimate luxury sharpener! 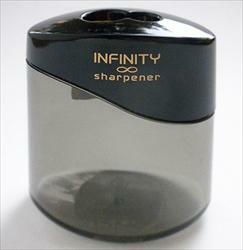 The Infinity Sharpener is a two hole brass sharpener set in sleek, heavy-duty black plastic. It features sharp, replaceable blades. The oval design allows it to fit comfortably in the hand for ease of use. Shavings are caught in the gray translucent, built-in receptacle.